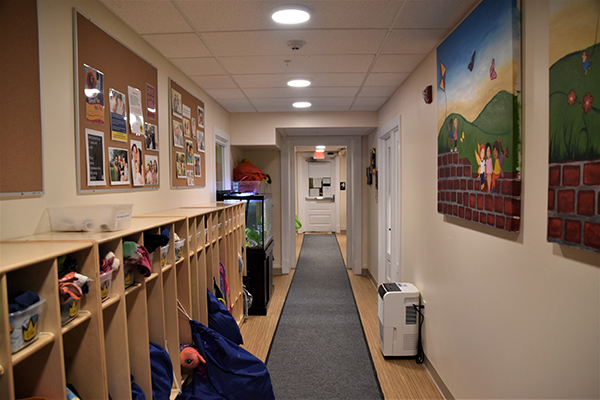 The George School Children’s Center goal is to provide a safe and stimulating environment that focuses on the physical, emotional, social, and intellectual growth of each child. 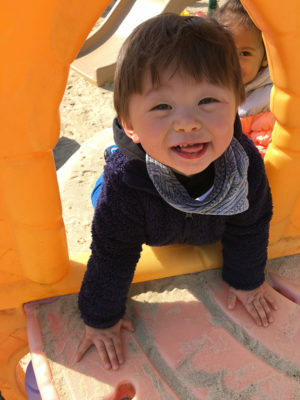 Children are encouraged to participate at their own level of development. 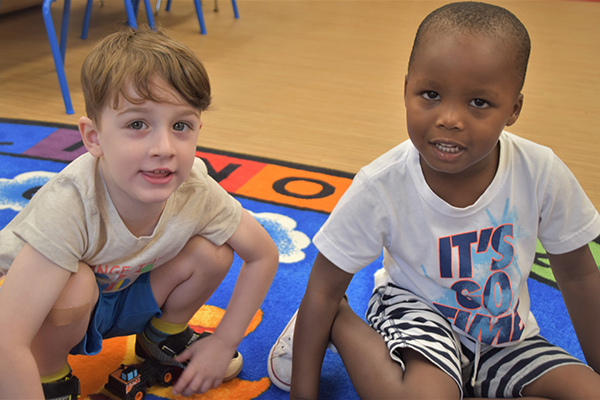 We strive to recognize the individuality of each child in an atmosphere where children are nurtured to explore, ask questions and experiment in learning-centered activities supported by Creative Curriculum. 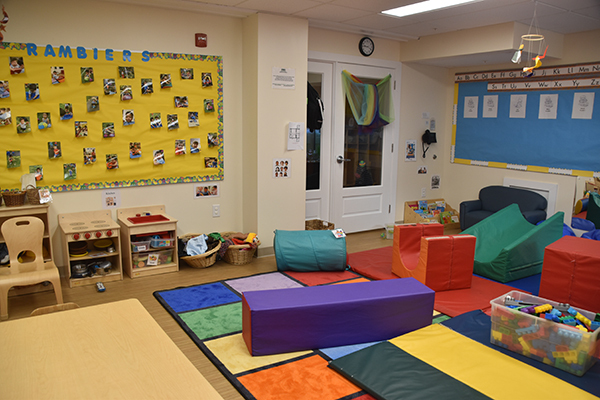 The Center opens at 7:30 a.m. Children are free to explore the various centers (including dress-up play and blocks) or enjoy a story on a teacher’s lap. At 8:30 a.m. our more structured morning begins and the older groups meet for a welcome. At 11:45 a.m. we wash for lunch. Children bring their own lunches. (Snacks are served mid-morning and after nap each day). After lunch the children are pottied and diapered as they prepare to relax for story time and nap. Children usually rest for approximately two hours. 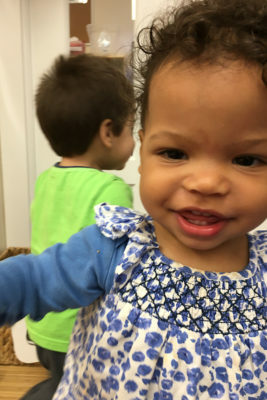 After nap, snack, and some casual play, the children prepare to go outside. We use a variety of outdoor play spaces in the afternoon. 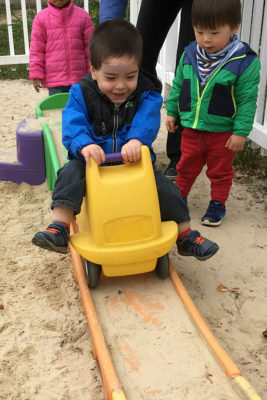 The children enjoy this block of uninterrupted playtime—plenty of time to explore, dig in the sand, race a wheel toy in our riding area, or kick a ball around the grass. The center closes at 5:30 p.m. sharp! Another day of adventure has come to a close! Our Lamb teachers provide a safe, caring environment for these very little ones who quickly move from their long days of sleep to lots of floor play and movement around the room. Teachers are on the floor with the babies, singing, talking, and interacting. 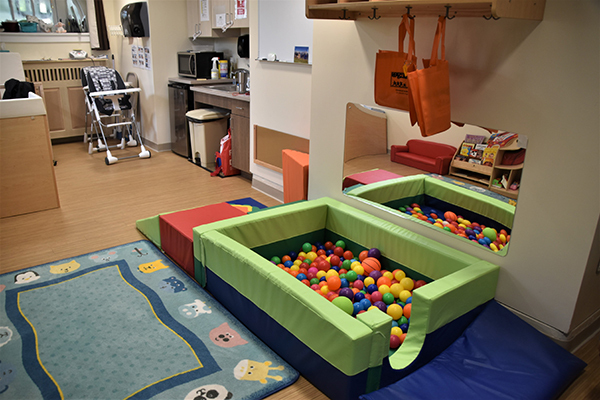 Observation plays a key role as our staff strive to provide the appropriate stimulation and activity to meet the needs of each baby. 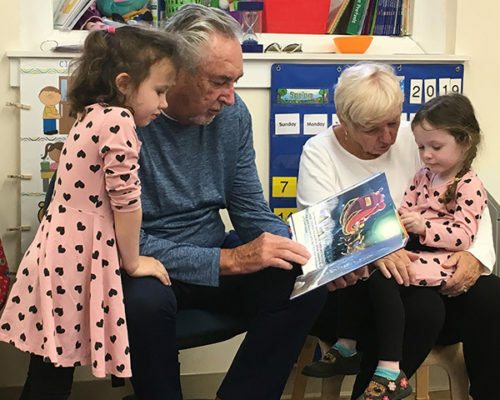 The schedule is developed around the needs of the children, with time set aside each day for music, reading, and very simple art projects in addition to feeding and napping schedules. We also take the babies outside every morning and afternoon for a carriage walk or stroll around the campus. As they get older, we introduce them to the toddler playground. Known as Ramblers, these little ones are off to explore the world. 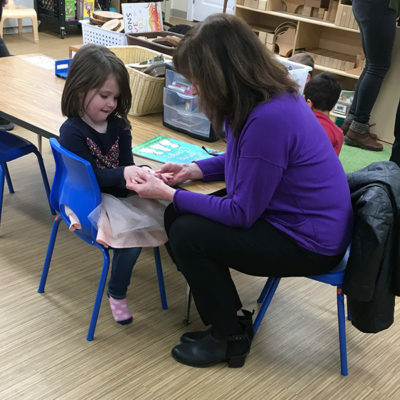 Over the bench, under the rail, they spend a large portion of the day developing their gross motor skills, both inside the classroom and outdoors. Outside play is a must for these little ones. 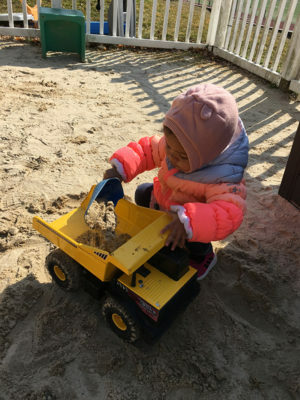 They have use of the campus at large, as well as a toddler play area where they can dig in the sand and play safely on size-appropriate equipment. 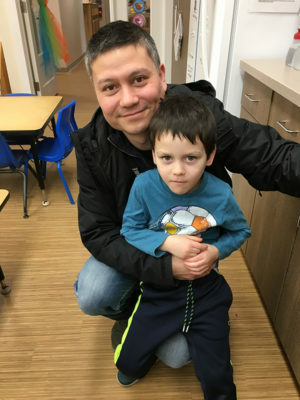 Their morning routine includes many hands-on art and sensory experiences as well as music and a lot of playtime. 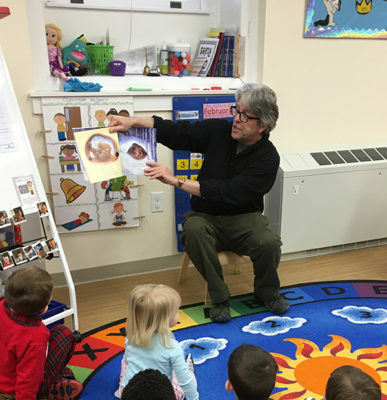 Children move around the room freely, often stopping to enjoy a few minutes of storytelling on a teacher’s lap. The children bring lunches from home, which they eat together around a low table. Morning and afternoon snacks are provided by the school. Children rest each afternoon for several hours on mats. Continual observation by the teachers remains key to providing an appropriate environment for these little ones. 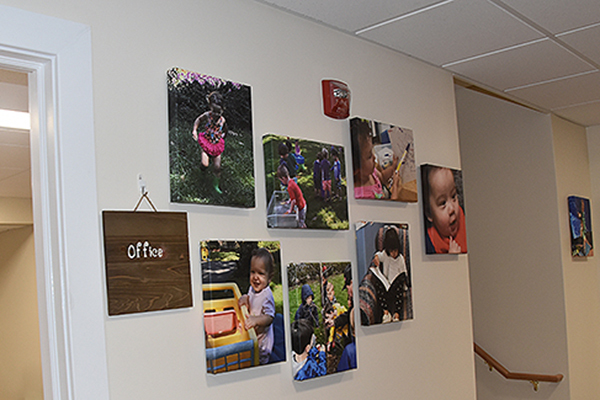 These two- and three-year-olds have just gotten their wings and love to explore the George School campus. They become great hikers as they journey down to the mulchy playground or to the barn to visit the horses, bunnies, and cats. 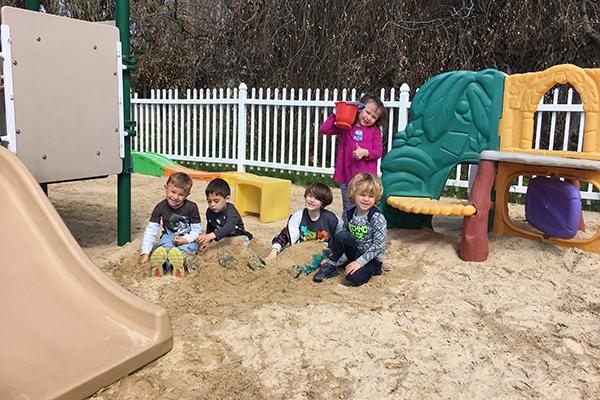 Buckets, shovels, and trucks are only a few of the tools we use at the sandy playground. 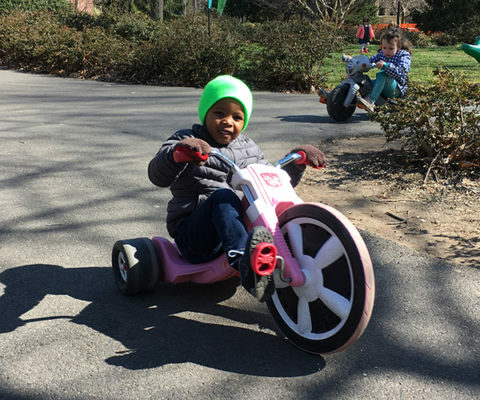 These busy toddlers work on their large motor skills on the bike path, too. Each morning, the children gather to say hello, sing a song or two, and enjoy a story. There is time for music and movement through dance, and plenty of time for dramatic play with trucks, dolls, and costumes. They are learning to gather for short periods as a group with stories and table-time activities. Puzzles, play dough, simple manipulatives, and a wide range of other activities are used during center time. They enjoy experimenting with scissors, crayons, markers, and a variety of paper and textures as a part of their daily “creative” time. These young toddlers thoroughly enjoy interacting with their friends and teachers. They develop their vocabularies and self-expression by leaps and bounds as the year progresses. Diaper time and potty time are an important part of the toddler routine. Our teachers listen to every child and respond appropriately to his or her development cues in this and other readiness issues. These children are on the go. Our group of three- and four-year-olds are full of adventure and the desire to investigate and explore their world. 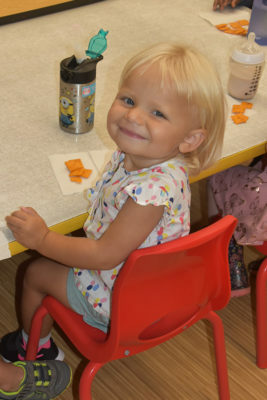 The children enjoy a day filled with activities and learning. 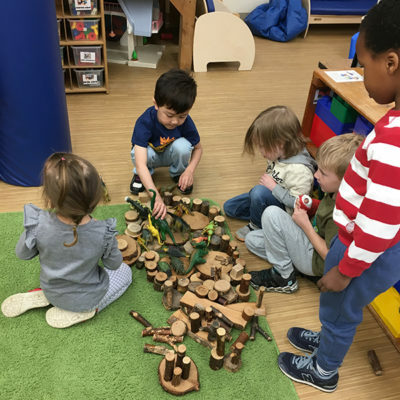 As friends arrive, they are greeted by name and welcomed to make a choice during free play. As the morning progresses, the children meet to talk about the plans for the day. 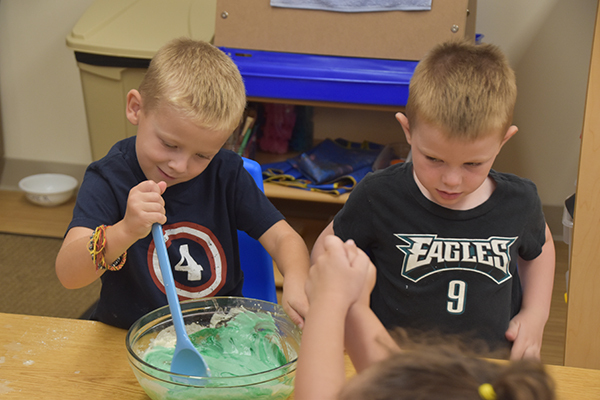 Centers follow, offering many developmentally appropriate activities going on throughout the room. The centers are always evolving and changing with the interests of the children. The art area (scissors, tape, glue, markers, crayons, etc. ), manipulatives (pegs, puzzles, lacing animals, pattern shapes), block center (wooden blocks of all shapes and sizes, cardboard bricks, and large rubber-like legos), dramatic play area (kitchen, refrigerator with foods to sort, dress-up clothing, and accessories), the quiet areas (the loft, library, cube), science (magnifying glasses, magnets, items from nature like pinecones, shells, leaves, etc.) are all options for the children based on their interests and abilities. Teachers lead small and large groups which support specific developmental activities like math, language, science, and more. Our evolving curriculum frequently develops from the interests of the children. 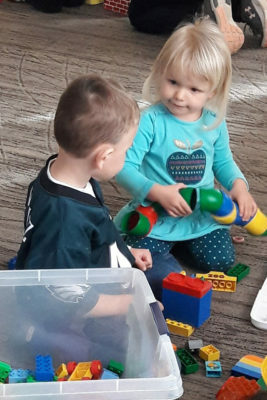 Creative arts, science, social studies, beginning language and literature, and math skills are interwoven in play and center time to help each child make sense of the new concepts they are learning. 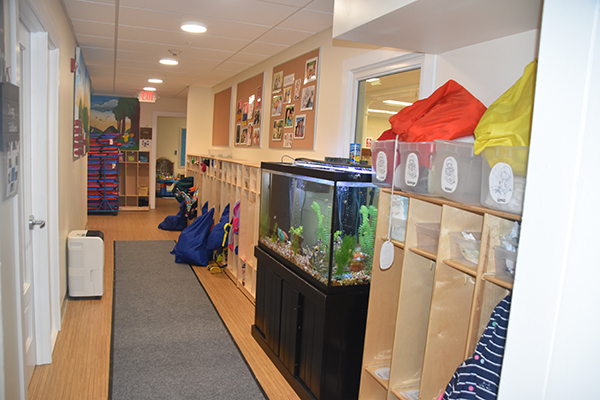 Their room often becomes a thematic world created by the children as they learn; you might see rockets, sea creatures, solar systems, houses from around the world, or even dinosaurs. The children are learning to work together and problem solve with the support of teachers. Morning meeting and circle time offer opportunities to learn new ideas. The children work on letter names and sounds, discuss new concepts and share ideas as a large group. During centers, the children make choices to join small groups at designated activities throughout the classroom. Outside play is an important part of our day.